Let’s face it, we all knew this was coming. 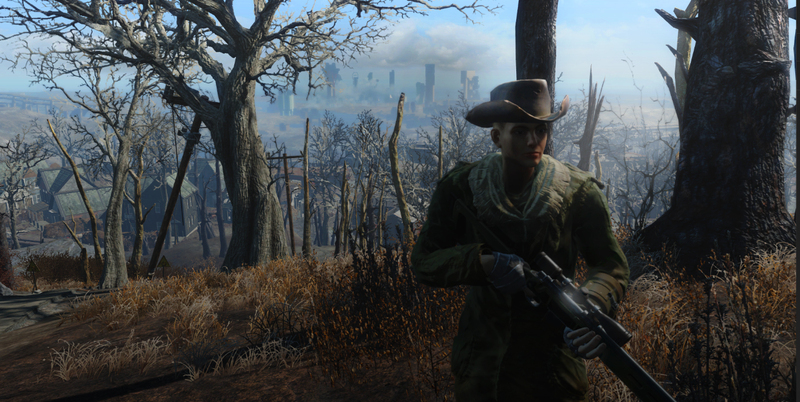 Fallout 4 is Bethesda Game Studios’ latest post-apocalyptic open world RPG, and after playing more than 48 hours in the ruins of a war-torn Boston I shall share my what this masterpiece has taught me about game design. In Fallout 4 there isn’t much time to get confused with the different systems or the hundreds of years of game lore when you boot it up for the first time. The apocalypse is closing in quick and your first step into this enormous world is to sprint to the local Vault: an underground shelter that houses those who can afford the high-tech amenities. Even once you are inside the vault you don’t have time to rest. I won’t spoil it but after a short and simple tutorial you are forced out into the wasteland to either follow clues of the main story or blaze your own path. Most GM’s are probably like me, losing sleep over how to start a new campaign. Consider taking a note from Bethesda’s book; make the campaign introduction short, sweet, and leaving clues in its wake. Let the players make discoveries about the story you have planned over time. This doesn’t mean that you should skip that awesome set piece moment you were planning, but consider allowing the players to simply have fun and chase a simple objective like storming a castle or clearing the town square of cultists. Players will appreciate being eased into a new world and not being thrown into the deep end of your home brewed ancient lore. The Institute are the surviving remnants of M.I.T. living in an unknown underground base somewhere in the vast sandbox of the game and are just one of many threats that await you in the Commonwealth wasteland. Their mysterious motives and seldom seen agents cause most residents of the Commonwealth to blame the Institute for most of the problems. To add to the paranoia, many believe that they can create perfect Cylon-esque clone copies of individuals to spy on the various civilizations across the ruined Boston. All of these factors make the Institute a great “boogieman.” Their greatest strength is that they are unseen and surrounded by wild rumors and conspiracies. No one knows what is actually going on in their labs or if the Institute is real at all. This same principal applies to the shadier factions of Dungeons and Dragons. Consider a cult devoted to a secret Aberrant deity that has conflicting and unreliable rumors about them. It will be a powerful reveal when you finally show what is behind the curtain. Always make sure not to reveal too much at once, as the player’s speculative imaginations may be cooler than any organization or creature you can throw at them. 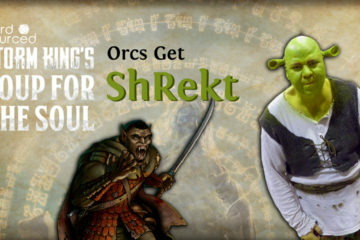 If you played Fallout 3 or the last few Elder Scrolls games made by Bethesda, you know they can get complex. Between gathering components for potions or medical supplies, enchanting swords and customizing guns and armor, the grind and crafting can get overwhelming. Luckily Bethesda has taken away some of the more tedious tasks in Fallout 4. Wastelanders no longer have to worry about repairing weapons and armor. To many this comes off as making Fallout 4 more casual like many claimed Skyrim was guilty of. But it was really a decision to get rid of game play that was little more than rinse and repeat menus that got between the player and exploring. And with Mod support already under way those who love more menus can download all kinds of things of hacks and assets to make Fallout 4 exactly how they want. Even with all the streamlining that Fifth Edition has done to Dungeons and Dragons, it can still be overwhelming for newcomers. With the combination of role-playing and trying to manage a character sheet that resembles tax form, the game is intimidating. Consider introducing players with just a basic version of their character and some dice. Have it focus on role-playing, dice rolling with simple modifiers, and the combat rule essentials. Every time you play you can introduce a new element until you are playing the full version of D&D. 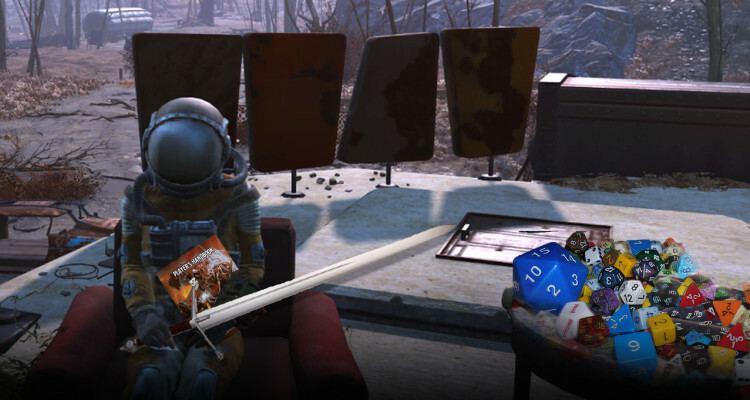 For more inspiration from video games, check out what Witcher 3 and Destiny taught us about D&D. If you enjoyed this article, consider leaving a comment below about what video games you’ve been inspired by.